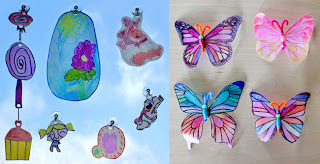 I just wrote another post over at Alpha Mom, showing how we made some window decorations and beaded butterflies using the plastic from gallon milk jugs. 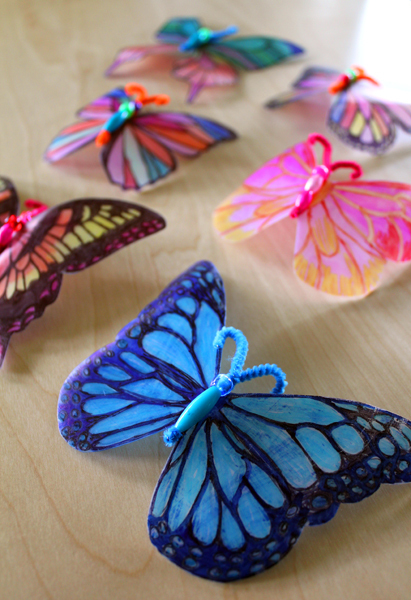 You can read about how we made them and get the free butterflies template here. We'll definitely be making more to hang in our windows in the future, and I doubt a milk jug will make it into our recycling bin without being used for this purpose again! I just need to get about a thousand more suction cups to keep up with the girl's creating. 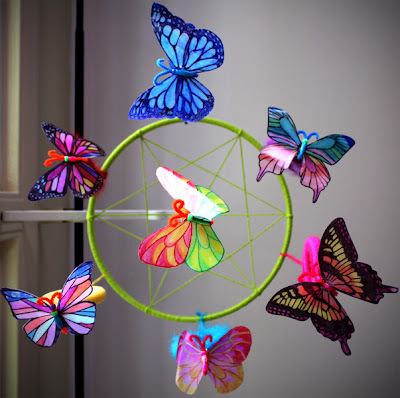 We used our butterflies to hang on a mobile for the third mini Filth Wizard, so in addition to the tutorial over at Alpha Mom, I thought I'd share with you a few pictures showing how we put the mobile together once we had made the butterflies. Here it is from the baby's veiwing angle, looking up from the chest of draws we have in our bedroom where the changing pad is. I used a few things that I'd found in thrift stores to put it together. 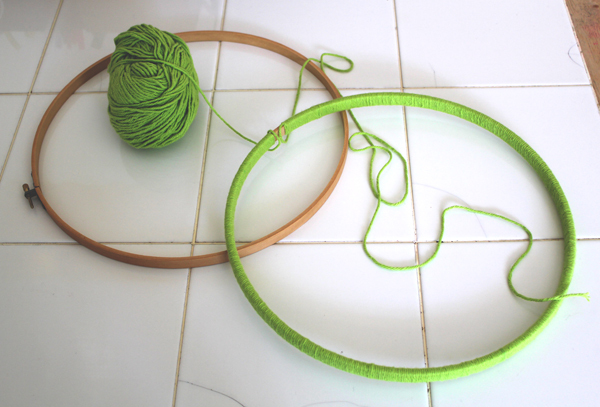 The main ring was part of a medium sized embroidery hoop that I wrapped in green cotton yarn. 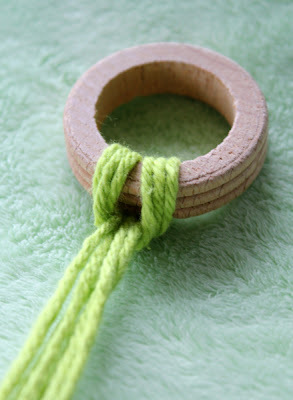 Then used a random small wooden ring that Paul had found in a big bag of misc wooden items at the thrift store to hang the mobile up from a hanging basket bracket. I'd also found some wooden curtain rings with little metal clips at the thrift store and thought if I covered those with some bright yarn remnants then they would look pretty and also allow us to swap out whatever was hanging from the mobile whenever we wanted. My two older girls are very into the idea of making new things to clip up there for the baby to see. 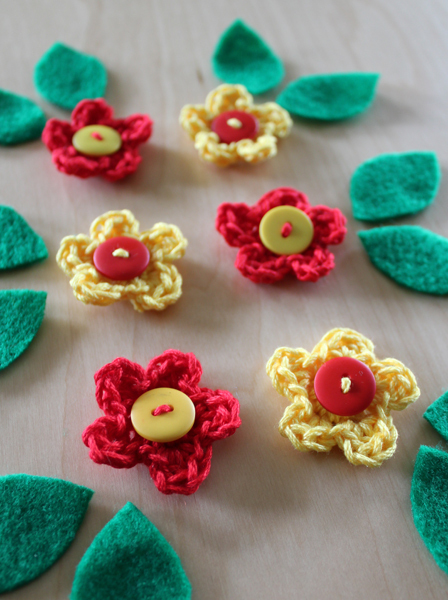 Once I tied all that lot on the mobile and hung it up, I thought it would be nice to have a little bit of decoration around the main hoop, so I cut out some felt leaves and made six little crochet flowers to attach using the mini flower tutorial over at Attic 24. Here it is all finished and hung up in the corner of our bedroom along with the rocker and towel rail we put up for hanging her clothes. 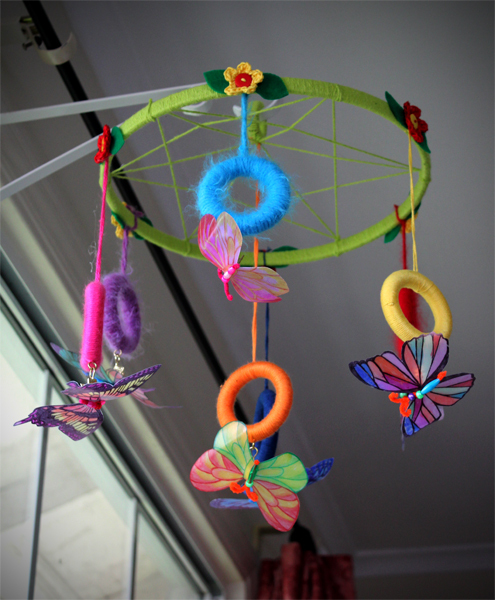 Have any of you made your own mobiles for your babies? I'd love to see some of them if you have! It'll be interesting to see what my older two girls come up with to hang on this one when they get bored with the butterflies. Thank you all for your congratulations and warm well wishing on the arrival of Delyth :) You're a lovely lot! It's nice to hear that a lot of you have more children than hands and are enjoying every minute of it too. Delyth is still an easy going little scamp and we're having a very relaxing and quite mellow start to the school summer vacation with her. She was two weeks old yesterday and Paul's been back at work this week, but thanks to some wonderful friends who have made us dinner on a few nights and another that had the big kids over to play for a few hours on Tuesday, I'm not feeling maxed out and have been able to have kids over to our place to play and get out a bit with them too. The trip I mentioned that we were going to attempt on Monday to the wild animal exhibit at the local library went much better than I had anticipated. No one was eaten by the artic lynx and no one broke the armadillo. Success! Made using the tutorial and pattern here at "This mama makes stuff". LOVE the recycled t-shirt gown! I love the idea of using the curtain rings-- what an easy way to change up the decorations for different seasons or just a change of pace. I have hung a variety of mobiles in the area where our picture books are shelved (I'm a children's librarian) but its always such a production because the ceiling height is such that I have to stand on a chair on top of a table (yikes, I know!) in order to reach the top. 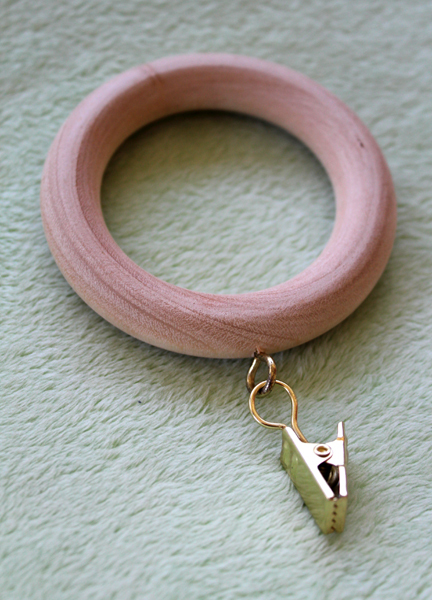 I'll be keeping my eyes peeled for some similar rings for a more permanent mobile that will still allow for lots of variations. Welcome to Delyth! I love the butterflies that the older girls made for her. 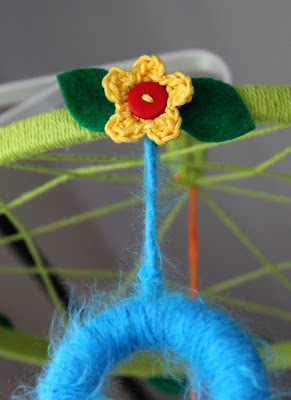 I made a mobile for my little guy, way back in the 1st trimester when I was feeling sick all the time and wanted to think about something fun and baby-related. Mine was very simple. I don't have a pic on hand, but here's what I did: I cut out several large-ish (~15 cm) bird silhouettes out of black card stock and hung them from fishing wire on two sticks (from a tree). Some of them hang vertically and some hang horizontally, so he can see them when he is lying underneath. The only tricky part was finding the center of mass to balance the horizontal ones. 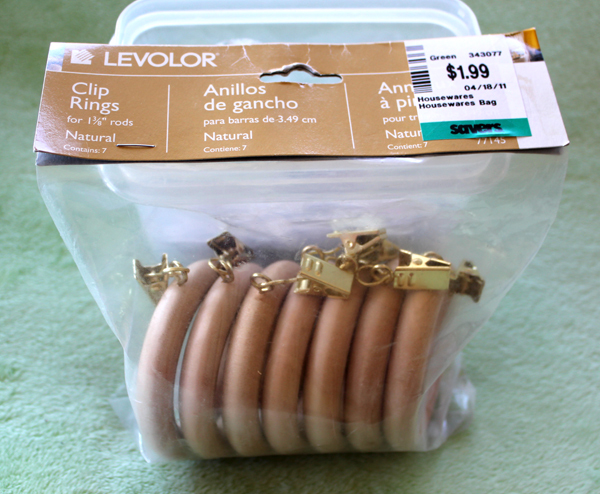 To do that, I balanced each on a pin. Also, they stay horizontal (rather than flipping over) better if you curl the edges of the paper down slightly. Baby noticed it almost right away and loves looking at it. Such a lovely mobile for such a lovely baby girl! So glad Delyth's here and safe. 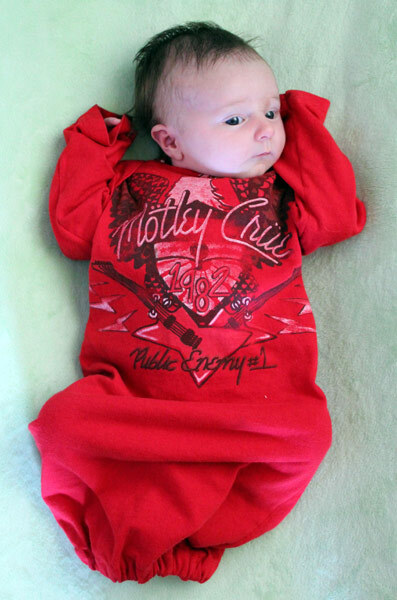 The Motley Cru onesie rocks! BTW, my girls LOVE your daughters' popsicle stick castle, think we'll be adding it to our summer to do list! I can't believe you have time to make these things! I just finished a mobile with quilted birds. I posted about it on craftster.org if you want to see it. I love your great ideas, by the way! Thanks and Congratulations! 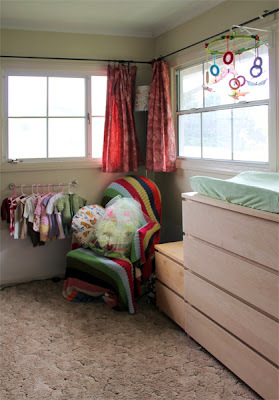 I couldn't find a mobile to match my nursery so I made my own too. I wrapped a styrofoam wreath with coordinating fabric, hung it (with ribbon) from a plastic ring and hung 4 of the tiny beanie babies from it. Congratulations for your new baby! All the hapiness for her and all your family! That's a beautiful mobile and that last photo is just too cute. Congratulations to you all. It is very different from yours, but my tiny friend loves it! Well, darn it! You put my mobile I just finished for my baby boy to shame. :) Beautiful! We just made some butterflies for my sisters birthday. I love how simple they were to make and yet beautiful they are! Thank you for all your ideas. That recycles T shirt gown is such a good idea! Thanks for sharing! Your tutorial has been featured on this week's top 10 newsletter. You can view the newsletter here. Keep up the great work! It's a great idea and it's easy to make it, too. thank for sharing it. Baby is here, and thank you LiEr!